← Peppers: Some Like it Hot! Some Like it Even Hotter! Eyes are so important, yet many of us forget to take care of them! Eyes give us sight, make it possible to take in the beauty of the world around us, admire the people we love, watch our favourite shows and read. Light is focused primarily by the cornea – the clear front surface that acts like a camera lens. The iris of the eye functions like the diaphragm of a camera, controlling the amount of light reaching the back of the eye by automatically adjusting the size of the pupil. The eye’s crystalline lens is located directly behind the pupil. This lens helps the eye automatically focus on near and approaching objects, like an autofocus camera lens. Light focused by the cornea and crystalline lens (and limited by the iris and pupil) then reaches the retina – which acts like an electronic image sensor of a digital camera, converting optical images into electronic signals. The optic nerve then transmits these signals to the part of the brain that controls our sense of sight. Keep your vision sharp – As we age, everyone has some vision loss, referred to as “AMD” (Age related Macular Degeneration.) There are some simple things we can do that help lessen the loss. Have your eyes checked regularly – Medical professionals can often detect health issues before we’re aware of them. Protect your eyes from sunlight – Wear a hat with a brim, and choose sunglasses that provide at least 98 per cent protection from UV rays. Eat healthy – Eat lots of foods high in omega3 fatty acids (e.g. fish) as well as fresh fruit, dark green leafy vegetables and yes, carrots. Be active – Regular exercise and weight control protects eye health. Quit smoking – People who smoke are three to four times more likely to develop AMD. Wear eye protection – When playing sports or working with tools or crafts, protect your eyes with Canadian Standards Association approved safety glasses or goggles. Be kind to your eyes – Light for reading should be stronger than watching TV, and light for sewing or working on crafts should be twice as bright as for reading. Don’t shut off all the light in the room to watch TV or a movie, or to play video games. Beware of glare – Make sure the area around your computer monitor is roughly the same brightness as the screen itself. If you can see yourself or parts of your environment in your monitor, you also have a glare problem. Adjust the monitor, or consider changing the position of your desk. 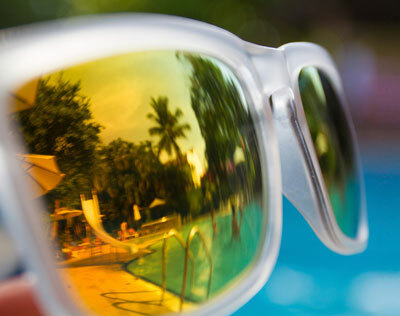 Sunglasses: try before you buy – Sunglasses should be dark enough to reduce glare. To check this, simply try them on in front of a mirror. If you can see your eyes, the lenses are probably not dark enough to block glare.